A couple of weeks ago, a thunderstorm went through and made the lights blink at my house. I've got UPSs on almost everything except my SageTV box. Yep, it wouldn't come back up. 2 beeps at power on and then nothing. Now this box run headless, no keyboard or display. So I headed upstairs to my parts stash and returned with a display and keyboard. What I found was that the CPU fan had died. I took it to PC Doctor in Memphis and they diagnosed and replaced the fan for just under $50 in 3 days. Not bad. But it was a real hassle to drag it out of the desk and hook up the keyboard and display. I found a D-Link KVM-121 at buy.com for $20 after rebate with free shipping. It supports not only the keyboard and display but sound. So now I can readily toggle between SERVER and SageTV. Hopefully I won't ever have to but I can. My wife's old ThinkPad T23 is getting long in the tooth. The wireless continues to loose NetBIOS so from time to time she can't get to the shared My Documents nor print. And the DVD drive keeps disappearing and reappearing. She's been exceptionally tolerant of it (more than I would have been). So when her birthday came around this year, I found her a Lenovo ThinkPad T61. Don't worry. I also got her some Irish pottery. It came with Vista Business and 1GB of RAM. I added a second GB. The OEM Vista was pretty clean as it was a business load. All seemed well until I started using it. I started having flashbacks of my previous Vista experience. I had the same problem installing the printers. At least I knew how to fix it but that shouldn't be a problem. I also have a problem connecting consistently to my WPA network although I'm not convinced that's not a Lenovo issue. Then when I got it all hooked up, I ran into of all things performance problems! It was taking 5+ seconds to open a new tab. Most of that time, IE7 sat with "Connecting..." in the tab name. All it was trying to open was about:blank. My friend Google finally turned up this forum post at Microsoft. The gist of it is that the slowdown was due to a BHO (CPwmIEBrowserHelperObject) that Lenovo had installed. I aggressively disabled (Tools/Internet Options/Programs/Manage add-ons) any add-on that I didn't know that I wanted and now the T61 runs great. I admit I'm a Google fan-boy. And I'm apparently one of the last to still be running Internet Explorer 6. But in the same week that Google released Chrome, they updated (?) Gmail for IE6. Thank you, Google, I think. What's next? Netscape? 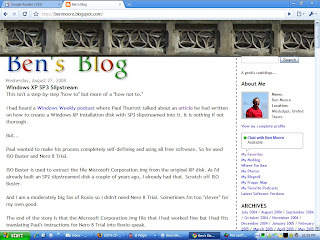 You know I'm a sucker for all things Google so I downloaded it and began playing with it. This post just has the first couple of things that caught my eye and interest. First, they lie to the web site. They probably have to or all the web sites would give them junk html. 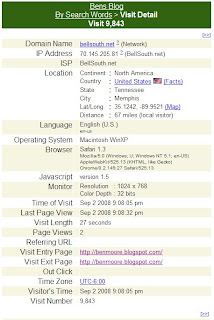 They tell the web site that they are Safari on Macintosh WinXP. That's a new operating system to me. Apparently the code base is Apple's WebKit. The rendering looks pretty much like Firefox as they both use the Gecko engine. As you would expect from Google (particularly in a 0.2 release), this thing is pretty minimalist but it is elegant. Look at the Find bar. And yeah, the up and down arrows are "previous" and "next." So subtle. IE 7 and Firefox 3 have gotten this thing about combining the history in "Back" and "Forwards" buttons. 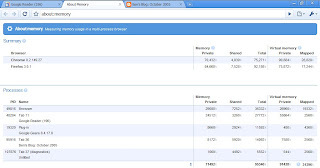 Chrome leaves the history on the appropriate button but adds a new user interface of clicking and holding to display it. Time will tell on this one. I've really gotten where I like the color coding of the address bar for SSL and EV certificates. Chrome has half of it. To show the EV certificate, you have to click on the lock in the address bar. 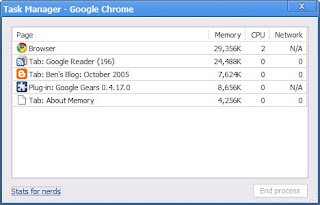 If you right click on the tab bar, one of the choices is "Task manager." I had to click that. Interesting but I couldn't resist the "Stats for nerds." 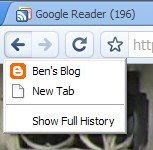 Remember the controversy over Firefox 3's address bar pulling up history? Google just went way beyond that. They use the address bar field for a search field also. Go play with it. Just remember that it's a 0.2 release!